It’s called Indian Veg. The food, although delicious, isn't why I like it so much. It's the charm of the place. You walk in to a bustling room attended by only a couple of staff. Every inch of wall space is adorned with bizarre vegetarian propaganda. But not in a preachy way – every poster or printout becomes a talking point because each one is utterly bizarre. They range from dramatic nutritional claims – "carrots keep you young!" – to adages about compassion. Images of random animals like macaws and tortoises border the posters. What’s more, there are blown-up newspaper headlines from tabloid newspapers, which I'm convinced are entirely fabricated. I'm just as bemused as to how the restaurant is still afloat. It costs £7.95 per head (£4.50 at lunchtime), you eat as much as you like, bring you own booze – so end up lingering long after you've finished eating – and it's located in expensive Islington. They even feed homeless people for free. The equation doesn't add up, and it makes me love it all the more. But onto the food. It's all vegetarian with roughly two-thirds suitable for vegans. Alongside classics such as yellow split-pea dhal and pilau rice are more obscure creations like a vegetable curry containing chunks of bread. A few of the buffet containers are filled with delicious deep fried goodies like pakoras, onion bhajis and little fried pita breads. I always eat loads of these because I can never muster the energy to deep fry at home. There are some more healthy options, as well, for instance cauliflower rice, beetroot salad and various grated, spiced slaws. Strangely enough, my favourite thing to eat there is the spicy mashed potato. Normally I don't eat too many potatoes – I’m not a huge fan of how they sit in your stomach – but this spicy mashed potato is something else. It's addictively salty, vibrant tumeric-orange and has a nice after-kick of chilli. I've attempted to recreate it in today's recipe, as well as a take on their pea curry. I'm particularly pleased with this because I've cracked what I call the 'takeaway curry consistency' – a smooth, soupy, rich sauce, as opposed to homemade curries which tend to be more chunky. The trick is to blitz the onion, garlic and ginger with a little water and fry the resulting paste. Here's a link to Indian Veg. I'm not at all affiliated with it. I just love it. In a large saucepan bring 1.5 litres (6 cups) of water to a boil with 2¼ tsp fine salt. Boil the potatoes for approximately 20 minutes until a skewer pierces them easily. Meanwhile, heat the oil in a frying pan over a high heat. Fry the black mustard seeds and cumin seeds until they start to pop (about 30 seconds to 1 minute). Turn the heat down to medium and fry the ginger, garlic and chilli for 3-5 minutes. Stir in the garam masala and turmeric and fry for 1 minute further. Stir in the milk (don't worry if it curdles) and remove from the heat. When the potatoes have finished boiling, drain and leave to cool slightly. Mash them thoroughly with a potato masher. Mash in the garlic-ginger-milk mixture and set aside. Blend the onion, ginger and garlic together with 4 tbsp water. I used an immersion (stick) blender to do this but you could use a food processor or jug blender. Heat the oil in a medium or large saucepan over a medium-high heat. Fry the onion-garlic-ginger paste for about 10 minutes, stirring every few minutes. Some of the water should have evaporated and the mixture started to brown by 10 minutes. Stir in the tomato puree, then add the cumin, coriander, turmeric and chilli powder. Fry for a few more minutes. If your coconut milk has separated once you open the can, mix it thoroughly with a fork. Stir the half can of coconut milk in to the saucepan mixture and then add the peas. If the curry looks a little dry add 60ml/¼ cup water. Bring to a boil then simmer until the peas are cooked through (about 5 minutes). Stir through the teaspoon of salt. 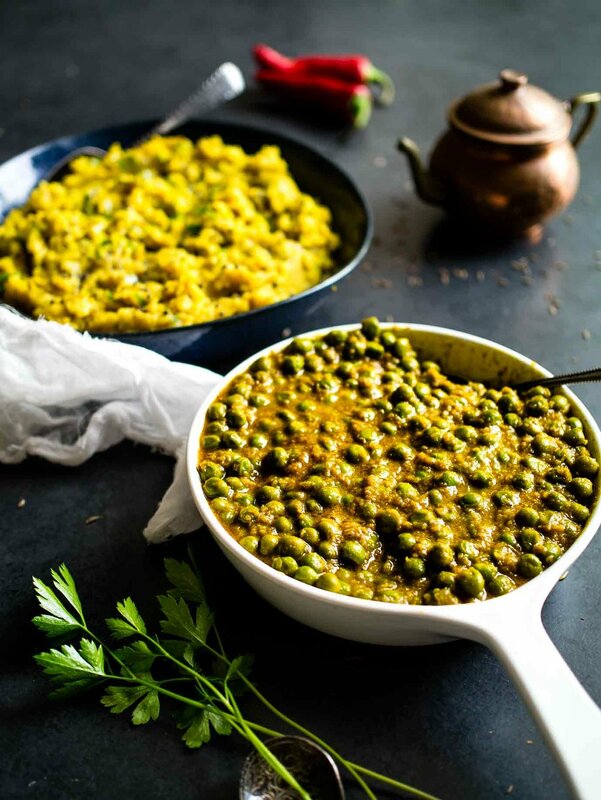 Spoon a serving of mashed potato onto each plate and pour over a serving of curried peas. Sprinkle over some fresh parsely or coriander if desired. 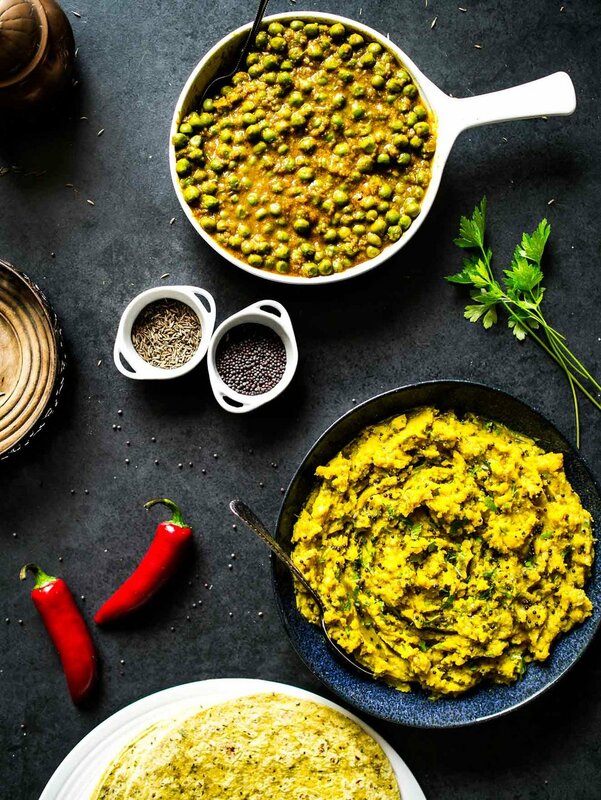 Curried Peas w/ Spiced Potato Mash = Mattar + Aloo Masala! Vegan Indian food at it's finest. Accidentally gluten free too!